Everyone knows that Kites are an integral part of everyday life in India & many other Asian countries. The apprehension and liveliness that can be seen on rooftops during kite battle that evokes viable spirit & enormous nostalgia. I love flying kites but who don’t loves to fly kite? Everyone (including you) must had a crush on kites in childhood or even now who knows? Even though I’m sure that some of our readers won’t admit their kite love right away, so do most adults! With anticipation that we all still have a little kid inside us and now I’ll suggest one of the best ways to find the little kid inside you by flying kites. Enjoying, without frustrations and provide hours of simple, inexpensive fun for kids and even for yourself! Those who take pleasure in showing their skills & enjoy all that drama of kite flying and fighting are going to love this application KiteFever. KiteFever is at present available for all android Operating Smartphones and is totally free-to-play, fun and colorful game. Play this is although simple but not that easy but exciting enough to keep you engage and excite throughout the game. There are no levels to achieve in this game which makes you totally care free but also allowing you to keep you engage and have fun while flying kites in this game, without any violence although kite fighting isn’t considered as violence, does it ? Developers or this game are planning to introduce some more features as well as improvements in this game with further updates. Your task is to cut as many kites as you can and go beyond the distance. You can even share your scores on various social networking websites such as Facebook and twitter. 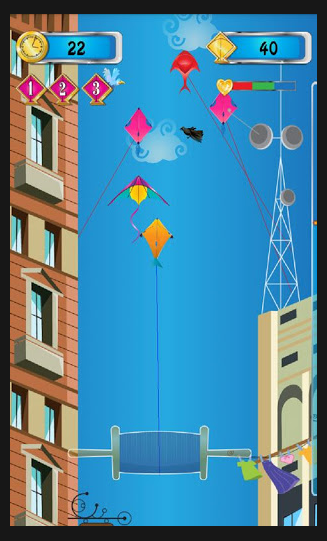 All you have to do is to click on the link below, Download Kite Fever, play and enjoy! Things to be looked for – Awesome sound and Background that provides a real life feeling.